New Forest Brushes: TUBBY BRUSHES NOW AVAILABLE! More will be made soon! These brushes have been made completely by hand. 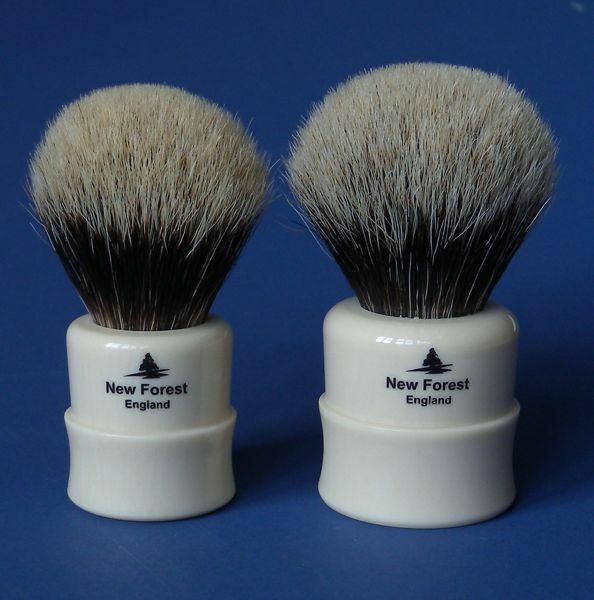 The knots are made in China and the handles are shaped by hand tools on a lathe in the New Forest and polished by hand. Brush making, the old fashioned way. While very good, the surface of the handles will show some small evidence of the fact that they are individually hand made. The Tubby 1 has a knot size of 24mm with a loft of 52mm. The Tubby 2 has a knot size of 26mm with a loft of 54mm. Handles are 41 mm and 45 mm. The Super Badger Two band knots have a nice backbone but they are not overly stiff and have medium density to encourage flow through.The delightfully soft tips and the bulb shape make the brushes perfect for face lathering with soaps and creams. Handles are in high quality alternative ivory and ebony, a cast polyester resin material. The Tubby 1 is £43 including worldwide delivery. The Tubby 2 is £48 inc. delivery. 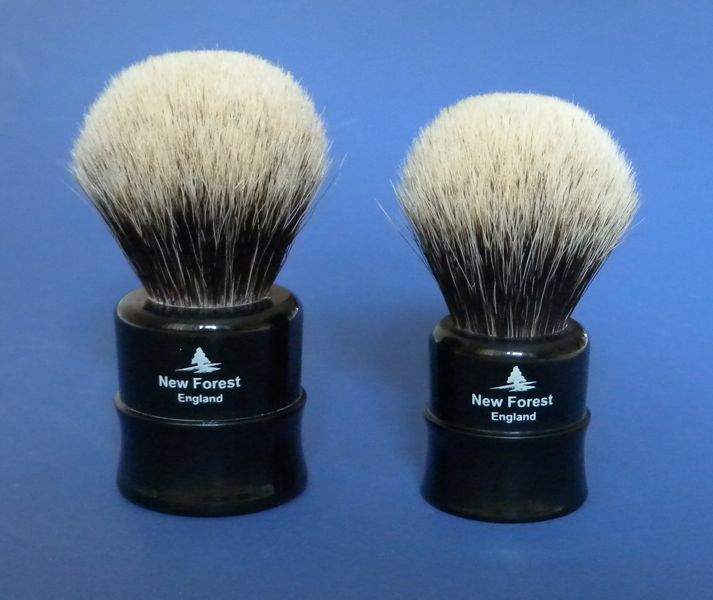 Order by making payment by paypal to NFB@padh.co.uk Specify the brush required and the colour of the handle. Looks good. Interested in a tubby 1 for sure, will keep watching to see when its time to order. Fido, for what its worth, it would be nice to be able to have the Tubby 1 available with a Tubby 2 handle (for us big handed guys). Also, how do the new two-band knots compare with your 2201 knot(which I really like)? How does density compare with the Chubby or a Duke 3? Not sure about that! I'd have to try one to see if the smaller knot looked right in the larger handle. The new two band knots are the same hair as I used in the 2201. Each batch is a little different as with all badger hair, but it has the same firmness and softness of tips. The density is similar to the Duke 3 and Chubby. Will the Tubby's be coming in the silvertip also? I think I would like a one and two in silvertip. I will assess feedback on the Super Two Band versions, then decide. Now that I have started making brushes locally it does enable me to consider greater variety. So I may well make a few Tubby in Finest Sivertip. News will be posted here! Loving my tubby 2 pete its bloody great,getting better every use as well,keep up the good work fella.. Thanks. I've made a breakthrough with my research to find someone to print my logo on locally made brushes. Ten Tubby 1 and a batch of my NF 2213 "Chunky" brushes will have the logo added within the next week or two. I'll be starting production of more Tubby brushes as soon as I receive a shipment of knots now on their way. I remember you commenting on the Simpson's Chubby series, if there could be a size that is in between the Chubby 1 and the Chubby 2. It looks like the New Forest Tubbys will fill that niche. Chubby 1 is 23mm knot, Chubby 2 is 27mm knot. Tubby 1 will be 24mm, Tubby 2 will be 26mm. New picture? Does it mean it will be available soon? I have literally just a handfull of Tubby 1 brushes now, complete with logo. Larger batches of both the Tubby 1 and Tubby 2 will be ready in 4 to 5 weeks. Anyone interested in the Tubby 1 can email me at NFB@padh.co.uk to confirm if any are still available now. I love my Tubby. I can't believe that amount of lather it whips up. It is a great brush at a great price. Thanks Ross - more in production and available soon! waiting for a tubby2. any expected date?